Our ongoing journey through the Solar System now brings us to Callisto: the least interesting of Jupiter’s Galilean moons. Callisto doesn’t participate in the Laplace resonance. It exhibits no geological activity, past or present. It doesn’t have a magnetic field, and its thin atmosphere is the generic CO2 atmosphere that almost all rocky planetoids in the Solar System have. Callisto’s surface consists of a mix of rock and water ice, and there may be a small ocean of liquid water deep underground. 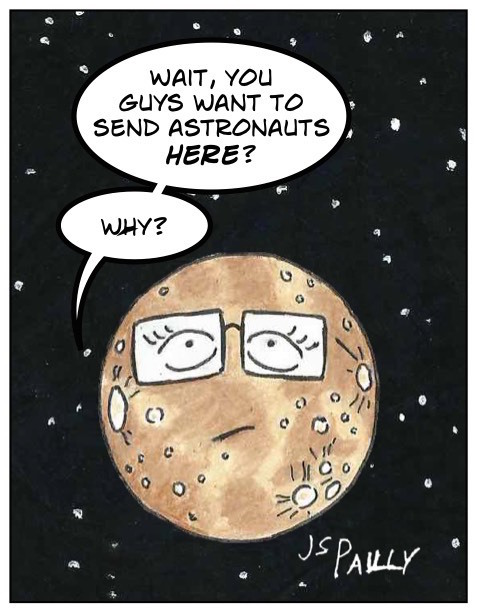 That’s pretty nifty, I guess, but it’s kind of old news after Europa and Ganymede. And without geological activity to feed nutrients into that ocean, it seems unlikely that life could have developed on Callisto. Yet NASA has taken a special interest in Callisto. If all goes according to plan, astronauts could set foot on this not-so-small moon as early as 2040. No, Callisto may not be as exciting as its neighbors. It lacks Io’s sulfur volcanos, Europa’s potentially habitable oceans, or Ganymede’s protective magnetic field. But according to a 2003 concept study called HOPE (Human Outer Planet Exploration), Callisto may be one of the safest locations in the outer Solar System to build a scientific research base. Why? Precisely because it’s so boring. No geological activity means we don’t have to worry about volcanoes or earthquakes (Callisto-quakes?). Since the odds of Callisto supporting native life are negligible, we don’t have to worry much about contaminating the Callistonian ecosystem… or about having the Callistonian ecosystem contaminate us. Even though Callisto doesn’t have a magnetic field like Ganymede’s to shield us from solar or cosmic rays, Callisto orbits outside Jupiter’s radiation belt. Radiation levels on Callisto are actually lower than on Ganymede. Once we’ve established an outpost on Callisto, astronauts could use it as a base of operations for further exploration of Jupiter and its other moons. Callisto’s water can also be converted into rocket fuel (liquid hydrogen and liquid oxygen), so the outpost could also serve as a fuel depot for missions beyond Jupiter. I can’t remember any references to Callisto in science fiction (though the mythical Callisto appeared in a few episodes of Xena). But if this seemingly boring moon has attracted so much attention from NASA, maybe it’s worth exploring as a setting for Sci-Fi stories as well. P.S. : A mission to Callisto in the 2040’s would follow close on the heels of NASA’s planned mission to Mars in the 2030’s. While the HOPE study made some excellent points about the viability of a Callisto outpost, I won’t comment on how realistic the mission timetable that might be. Concept for a Human Mission to Callisto in the 2040s from Beyond Earthly Skies. Is There Life on Callisto? from Mysterious Universe. Jupiter’s Moons in Fiction: Callisto from Wikipedia. Posted by J.S. Pailly on August 24, 2015 in Jupiter (2015 Mission), Mission to the Solar System. Interesting. I didn’t realize any of Jupiter’s major moons were outside of its radiation belt. Yeah, I’ll believe it when I see it on the 2040s mission. I’d sort of assumed the same thing, but apparently Callisto is just barely out of the radiation belt’s reach.